A little confusing at the start, the SEO games can be a fun way to test your knowledge and maybe learn more, but also a very easy place to get stressed after spending a lot of time stuck into a page with no apparent solution. Who created those games and what can you learn from beating them? Where to start… Or something like that. Alexis Sanders, technical SEO at Merkle Inc., is the brain behind the technicalseo.expert game. Gladly, this challenge created last year is still available to play. As you can imagine, once the secret pages are leaked or if eventually Google indexes the pages, the mystery is gone and the game is over. This challenge has levels one, two and three and the first people to finish can have their names in a not-so-secret hall of fame — You still must know the very basics of SEO to find out where it is! The idea behind the game was to allow junior SEOs to explore the technical aspects of a website. “Level two was created to push the nerdiness to the next level and it continues at the same pace as the end of level one. Level three was designed so no one would pass”, explains Alexis. “I wanted something that would push the challengers. Each individual challenge, in itself, is horrible. It also intertwines, whereas the first two levels are very linear”. So far, 180 SEOs from around the world managed to finish the game. The declining number per level is an indication of how the difficulty grows, with 125 people finishing level one, 40 completing level two and only 15 beating the third challenge. If you want to try, the hall of fame still has vacancies in levels two and three! Dean created three levels so far: first and second in July and August 2014, then the third version in September 2016, lasting until November the year after. So far the game has made over 100k page views, considering only the tracked pages, as some URLs can’t be tracked. Each version took between three and four days to be developed. Where are the challengers from? 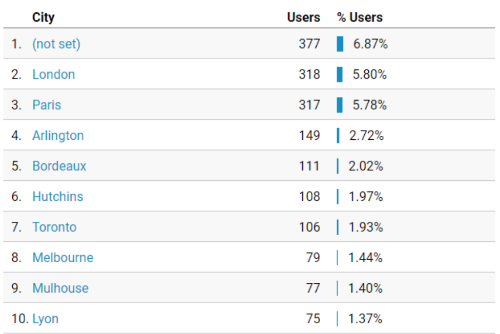 The techinicalseo.expert domain surpassed 5000 users so far, and the average session has 10.73 pages visited. 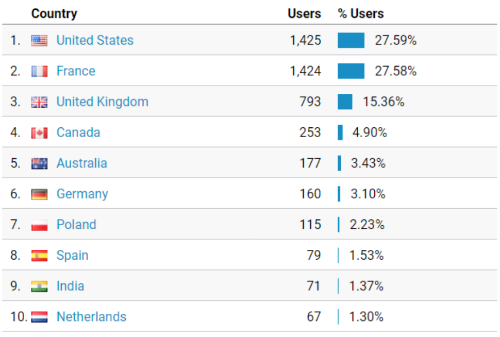 The game was created in the USA, but the audience has been neck-to-neck between American and French-based SEOs. Going on a more granular level, unfortunately, the well-known (by SEOs) city called “(not set)” takes the lead, followed by the real cities of London, Paris and Arlington in Dallas (USA). Curiously, the most popular page is the beginning of level 3. My guess that this is due to curious minds taking a step ahead before finishing levels one and two (you’ll understand once you start playing). There’s some URL guessing on the game, but the most popular 404 is https://technicalseo.expert/playertwo/, most likely due to a lack of attention from players. Shoving more the data, 14 out of the 15 people who finished level 3 are Europe-based, with one Canadian making the hall of fame too. “This is surprising because one of the challenges in level three is particularly hard for non-US challengers (an oversight in the build)”, reveals Alexis. 1. Tenacity — I think these challenges are 99% mental stamina. The answers are all available. It’s a matter of being thorough and exploring different approaches to the page. 2. Source code/DOM — Required from level one forward. 3. Understand user agents — This will be helpful throughout all challenges. 4. Headers — This will be helpful throughout all challenges. 5. PWAs — Useful for level two and three. 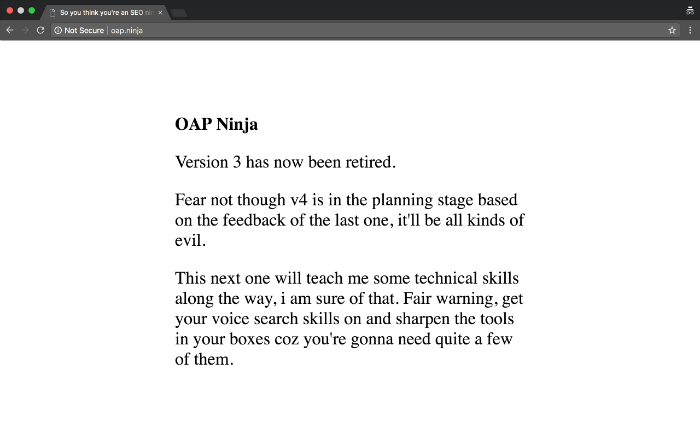 Since the oap.ninja versions one to three are retired, Dean shared at Optimisey a “stress-free” walkthrough on the v3. Some concepts there will also help you to finish Alexis’s games, so worth checking out (or not, if you want to do it 100% by yourself). If you’ve been through all the games and found every secret URL, there’s more for you soon. Dean is planning to release v4 of oap.ninja in April 2018. “Alexis let me know that she was inspired to create a version of her own game based on mine, which is a huge compliment considering the levels of evil she has added to her level 3”, says him. In return, Dean felt inspired to create a new version and spills out a taste of what SEOs can expect. “It’s mainly due to that torture that I promised Alexis equal pain through mirrored sites and all other kinds of VPN shenanigans to get my revenge”, he teases. What do you think about these SEOs games? Have they helped you to learn something new or don’t you like them at all? How much angry have you felt and what’s the happiness after realising the answer was just in front of you? Leave a comment below! Originally published at www.stateofdigital.com on March 1, 2018. Test your technical skills by beating the SEO games was originally published in gpelogia.com • Digital Marketing on Medium, where people are continuing the conversation by highlighting and responding to this story.